When The Ken Blanchard Companies asked 1,400 people the question “What is the biggest mistake leaders make when working with others?” 41 percent of respondents identified inappropriate communication or poor listening. When these same respondents were asked to look at a list of common mistakes and choose the five biggest missteps by leaders, two responses stood out. 28 percent of respondents said they rarely or never discussed future goals and tasks with their boss—even though 70 percent wished they did. 36 percent said they never or rarely received performance feedback—even though 67 percent wished they did. Why are communication and feedback such a challenge in today’s workplaces? The fast pace of work and increased workloads are certainly part of the equation—but another possibility is that new managers are not trained in either of these essential skills. Research conducted by the Institute for Corporate Productivity found that 47 percent of organizations do not have a formal training program in place for new managers. Research by leadership development consultancy Zenger Folkman has found that most managers don’t receive training until they are ten years into their managerial careers. That’s too late. Harvard Business School professor Linda Hill has found that most managers who survive their first year develop habits—good or bad—that they carry with them for the rest of their careers. 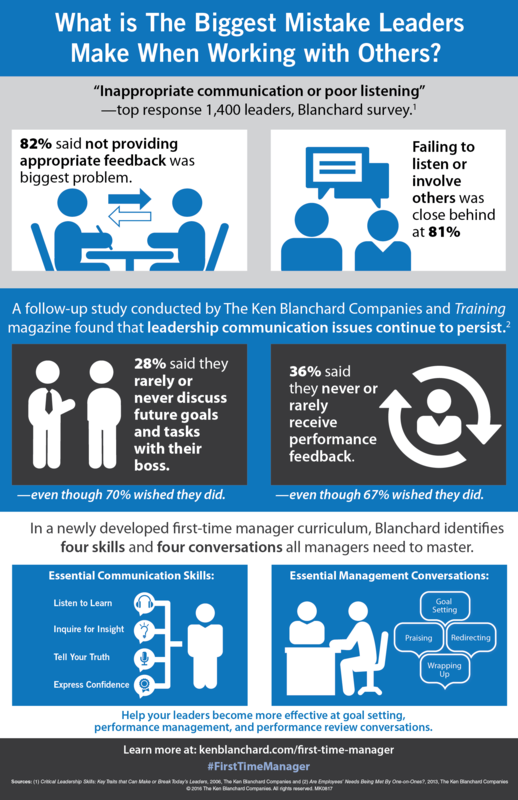 The Ken Blanchard Companies believes it is essential for new managers to develop good communication skills as they step into their first leadership roles. In a new first-time manager curriculum, Blanchard identifies four communication skills new managers need to develop as well as four conversations new managers need to master. Listen to Learn—a deeper type of listening where the goal for the manager is to hear something that might change their mind, not just prompt a response. Inquire for Insight—when the manager uses questions to draw people out and probe for understanding that might not be shared at first. Tell Your Truth—being direct in communication in a way that promotes honest observation without assigning blame. Express Confidence—conveying a positive attitude toward the other person and toward future conversations, regardless of the subject. The Goal Setting Conversation—setting clear objectives: all good performance begins with clear goals. The Praising Conversation—noticing and recognizing progress and good performance: catch people doing things right. The Redirecting Conversation—providing feedback and direction when performance is off-track: seize the opportunity before the problem escalates. Becoming skilled in each of these areas not only helps new managers get off to a great start but also can help them succeed for years to come. How are your managers doing in these critical areas? You can read more about the Blanchard approach to first-time manager development in the white paper Essential Skills Every First-Time Manager Should Master. Managers tend to talk far more than they listen. In the article “Transforming the Engineer into a Manager: Avoiding the Peter Principle,” Civil Engineering Practice, Fall 1989, the author, Dr. Neil Thornberry a Professor at Babson College, asserts that young engineers are judged on technical merit and accomplishment, and that promotions go to the technically proficient and verbally expressive engineers, while less technically proficient and less verbally expressive engineers wait their turn. Dr. Thornberry found that for a group of engineers the MOST talkative, competent engineer gets the first promotion into management. The second MOST talkative, competent engineer gets the second promotion into management. However, the third MOST talkative, competent engineer makes the BEST manager. Now let us presume that a growing company keeps promoting their most talkative competent engineers into management. What do we have? The best technical experts no longer doing the work and the best managers not in management and if they are in management they report to someone who is less capable of managing effectively–they talk too much and listen too little. No wonder so few CEOs have a positive culture. Hi Bob–thanks for sharing that research–that is such a telling finding–that promotions go to the technically proficient and verbally expressive engineers first. (And it is a practice I’m sure extends beyond engineering promotions.) With so many people identifying listening as a key managerial skill in short supply it seems like we have to take a look at who we are promoting–or better–provide the communication training new managers need to succeed.